Marshmallow plants were a native of Europe and Asia, but they are also now found in areas of the U.S. as well and have been used for over 2500 years for healing and soothing respiratory conditions and digestive issues. It has been used in folk medicine to treat the pain associated with constipation, and the discomfort that accompanies diverticulitis and irritable bowel syndrome (IBS).The mucilage content of Marshmallow extracts has the ability to soothe hacking coughs and sore throat. The herbal extract can be very helpful in conditions of the urinary tract, relieving burning urination, inflammation and pain. Externally, Marshmallow root extracts have been found to be effective for the treatment of boils, sunburns, burns, chapped skin, minor wounds, dermatitis, bee stings, abscesses, varicose veins and even toothache pain. Marshmallow has also been used in suppositories for hemorrhoids, and as a gargle for dry mouth and throat irritations. This herb has been put to use for centuries, thanks to its overall healing, calming and soothing properties. And, the many health benefits may be contributed to the vitamins, which boost the immune system, such as vitamin C and vitamin A, beta-carotene, amino acids, and pectin. 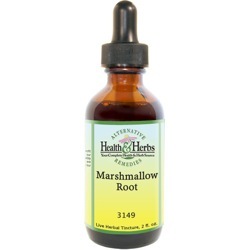 If you experience trouble with asthma, bronchitis or other respiratory problems, Marshmallow Root with its high mucilage content, makes it a soothing and effective respiratory system supplement. It aids the body and has been used in herbal medicine for expelling excess fluid and mucus, as well as soothing the mucous membranes and a dry, hacking cough. Marshmallow has been used to relieve the pain of headaches and muscle aches. It has also been found to be quite soothing for a sore throat, mouth sores, and has an anti-irritant effect on all mucous membranes. Marshmallow root, or Althaea officinalis, contains mucilages, which may be responsible for the herb's effect on the urinary tract, according to the "PDR for Herbal Medicines." The roots have an anti-inflammatory and an anti-irritant effect on the mucous membranes, including the bladder and urinary tract. If you have a UTI, bladder inflammation can reduce the amount of urine your bladder can hold comfortably, which causes the body feel the need to urinate frequently. Marshmallow may reduce bladder inflammation and soothe urinary tract membranes. Decoctions of the plant, especially the root, are found to be an excellent remedy for the relief of pain and irritation. It has also been recommended in hemorrhage from the urinary organs, as well as for easing the passage of kidney stones, bladder infections, and cystitis. Marshmallow Root, when used externally, may be used in an ointment as an emollient to soften and soothe dry, chapped skin. As a soothing demulcent, it helps to heal the skin and has been used for the treatment of wounds, rashes, burns, eczema, psoriasis, and diaper rash, and other skin problems. Ingredients: Marshmallow Root, Structured Water, 20% Alcohol. Non-Alcohol: Marshmallow Root, Structured Water, Vegetable Glycerin. Contraindications: Currently, there are no known warnings or contraindications with the use of Marshmallow Root Herbal Supplement; however, taking Marshmallow and iron together may reduce the absorption of the iron.